Bear Valley Community Healthcare District’s Family Health Center was awarded the PRIMEd Award of Excellence. On October 29th and 30th PRIME participants from across the state convened in Sacramento to share lessons learned, opportunities for improvement and what was successful amongst the PRIME group. PRIME is a program funded through California Department of Healthcare Services (DHCS) to address pain management in response to the opioid epidemic. BVCHD’s Family Health Canter was awarded funding through PRIME in 2017 and has started offering alternative methods for pain management, such as, Reiki, sleep coaching, meditation, hypnotherapy and mindfulness. o Why the intervention or improvement is innovative. Note: The improvement or innovation does not need to include use of new technology or require significant resources – it should focus on how your entity is thinking “outside the box” to improve care for Medi-Cal members. According to DHCS, the “PRIMEd Award of Excellence” was awarded to one Designated Public Hospital (DPH) and one District Municipal Public Hospital (DMPH) whose efforts best exemplify the interventions or improvements that represent a commitment to the experience and health outcomes for Medi-Cal members and to the PRIME Program as voted on by conference attendees. Contra Costa Regional Medical Center (DPH) won for their “The Inclusive Pride Initiative” in the DPH division. Their initiative has three components: 1) Improving understanding of LBGTQ patients and their care needs by collecting sexual orientation and gender identity (SOGI) data, conducting disparities research and upgrading our electronic health record (EHR) system; 2) Reducing barriers to care with Gender Clinics for transgender patients and a partnership with the Contra Costa Health Plan to ensure timely access to care for LBGTQ Medi-Cal patients; and 3) Creating a welcoming environment with updated policies, procedures and training. 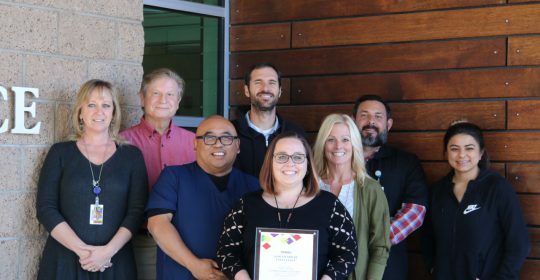 We are excited to announce that the BVCHD Family Health Center won the DMPH division for advances made in our Chronic Pain Management program. In an effort to stay on the cutting edge of alternative methods for pain management, a sampling of patients was surveyed to assess their interest in various modalities. The survey showed that our community would embrace acupuncture, Reiki, sleep coaching, meditation, hypnotherapy and mindfulness. Based on these results, BVCHD was able to collaborate with community resources to increase access to care for Medi-Cal patients through incorporating these alternative modalities to compliment the service offerings at the Family Health Center. This “outside-the-box thinking”, in addition to mental health services, chiropractic, physical therapy and primary care has made a substantial reduction in the need for controlled substance prescriptions within the community. Through these measures BVCHD has made a positive impact on Medi-Cal beneficiaries by offering options for care and overall improving quality of life.